What was it like to work in Termite Terrace, birthplace of Bugs Bunny, Daffy Duck and a veritable horde of cartoon icons? Get a taste of that crazy and creative fun factory in this loving and droll documentary, hosted by ace animator Bob Clampett. Featuring interviews with fellow Termite Terrace residents Friz Freleng and Tex Avery and narrated by Orson Welles, Bugs Bunny Superstar includes nine complete cartoons that are prime examples of the collaborative efforts of Warner cartoonists, ink-and-painters, effects artists and others. "No idea was too outrageous," Clampett says. Seeing rare home movies of the animators as they act out ideas adds to that sense of unrestrained creativity. I really like this DVD.. It explains how Bugs Bunny ,Daffy Duck and other characters were created. At first I thought it might be a little boring documentary but it was actually pretty interesting and it is great to see the old cartoons. 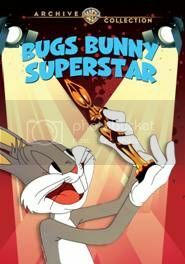 I think this is a great DVD for those who absolutely love Bugs Bunny cartoons.